There is a voyeuristic thrill in contact sheets, the direct prints used by photographers of the pre-digital age to edit their work. You look directly through the photographer's eyes as each photo gets closer to that perfect shot. And yet, it's often the photos not chosen that best capture the true spirit of their subjects and the life they lead after the director yells cut. This was never truer than in the classic Hollywood era, where behind-the-scenes photos were carefully vetted for marketing purposes and unapproved shots were never expected to be seen again. 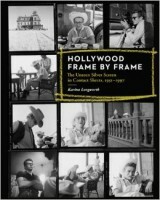 Hollywood Frame by Frame presents hundreds of never-before-published photos from the sets of some of the greatest films of the twentieth century. Hollywood's biggest stars are caught with their guard down behind the scenes of movie classics from Some Like It Hot and Breakfast at Tiffany's to Taxi Driver and The Silence of the Lambs. A treasure trove for any fan of Hollywood's Golden Age, this rare glimpse of the unseen silver screen will intrigue even movie buffs who think they've seen everything.